Someone is killing prominent people and sending the police DVDs of the crime scenes—minus the bodies, with a personal voiceover narration, the only clue they have to the killer. Though the locations can be identified, the bodies don’t show up until days later, generally in or near water. So far, the crimes have taken place in three countries: in Scotland, Copenhagen, and Sussex. The victims are a Lord Justice, The Ambassador to Denmark, and a prominent teacher. Detective Superintendent Eloise O’Neil’s elite task force is brought in. Organized for such high-profile cases, the team consists of O’Neil, Detective Inspector Matthew Ryan, Grace Ellis, a computer expert, and her husband, Frank Newman, a retired MI6 agent. Eventually, Ryan’s twin sister, Caroline will also be brought into the case. Though blind, Caroline is an expert on voices, accents, and dialects. Spielberg feels she is righting a wrong. “They deserved it,” she says, but whether it’s for something the victims did or something they neglected to do, isn’t certain. Then another victim disappears, this one in France, and two seemingly unrelated deaths are determined to be of people who were innocent bystanders, in the wrong place at the wrong time, seeing something they shouldn’t have. “Are you going to tell me what’s bothering you?” Ryan asked. Then Spielberg calls. Ryan is the one to whom she speaks, and the rapport established between killer and pursuer brings a link leading to the most important clue of all. 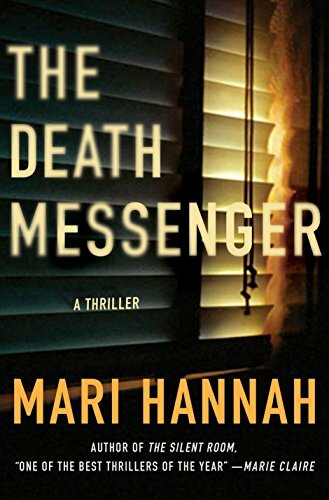 The Death Messenger is a complex and engaging mystery with characters in whom the reader will soon have a definite interest. Though it isn’t explained in detail, the inference is that O’Neil and Ryan have a history, having met on opposites of a disciplinary action. Indications are that Ryan would like to be more involved with his “guv’nor” than he is, though at present O’Neil is detached. Grace and Frank are also already known to Ryan, but the relationships are once again suggested rather than overtly explained. The story is a fast-moving one, with the handicap of the missing bodies causing the team to do a great amount of guesswork before they have something tangible. The only jarring note to the story is how argumentative and contentious the four main characters can be at times, when the wrong word or a misplaced scowl brings immediate reaction. Indeed, the team seems to spend so much time arguing that it’s surprising they manage to solve the crime. Each member of the team is prickly and thin-skinned at the most inconvenient moments. The near-harassment of O‘Neil by Newman about her ownership of the apartment they make their headquarters seems to be for no other reason than because he can, as does the humiliation it brings her. That flaw aside, this novel is chock-full of descriptions going a long way toward establishing the cold, wet locale where the crimes are committed. Upon reading them, the reader will be swept into the bitter cold of Scotland in winter where a good portion of the action takes place. That cold isolation, along with the chilling sections of the narration given from the killer’s point of view will be enough to send more than one shiver down the spine, no matter the room temperature. This is the second novel in the Matthew Ryan series, and is the eighth book for author Hannah. All indications are it won’t be the last, so the reader can look for future entries with anticipation.